Ok- so back in September I went to my primary care doctor with symptoms of bloating, horrible diarrhea, nausea, etc. I took a blood test, and it came back positive for Celiac Disease. I was gluten free for about 8 weeks when I finally made it in to the Specialist. When I got there, I took another blood test and it came back negative for celiac. I want an accurate diagnosis for my file so have decided to take the gluten challenge. I started getting symptoms back about 2 weeks in, like headaches, bloating but the really bad symptoms just started (I’m 5 weeks in- horrible stomach pains and diarrhea, face sores, rashes on arms). I have been eating TONS of gluten. Think a bagel and multiple slices of pizza a day. I planned on taking the blood test 6 weeks in but am scared this will not be enough time. If the second test is negative, should I just go with the results of the first test? I would hate the Specialist to give me an all clear if I really do have this condition. I also would hate for these 6 weeks of suffering to be for nothing. Any help or guidance would be greatly appreciated. Why did you have a second blood test in the first place? Why wasn't your first test good enough? I'm super confused. I have no idea!! My gastroenterologt’s practice has horrible reviews (but the only practice in my toe ) & truth be told, he didn’t offer me any valuable information. He didn’t even comment on my original results. I will post my original results here & see if anyone has feedback. Are you doing the challenge for gi endoscope ? is the Dr unwilling to diagnose based on the blood test alone? (look up a thread on the forum here -I personally would see if they will diagnose based on blood test and potential DH biopsy and scope to see damage but I would not finish the challenge if I didn't have to. in fact you got farther than I did on the challenge my symptoms are multiple and I could not finish I will not bore you with details but 4 decades undiagnosed does lots of damage. Are you doing this based on the diagnosis parameters? will they move scope up? I am sorry that you were advised to go gluten free after your first blood test. All testing (ALL) requires you to be on a gluten diet with the exception of genetic testing (which helps to only rule out celiac disease). After your first blood test you should have been referred to a GI who would order an endoscopy to obtain intestinal biopsies (confirm a celiac disease diagnosis). If the wait time for a GI consult suit is long (this often occurs in Canada), patients can go gluten free. Their challenge for just the endoscopy is about two to four weeks at most. The bottom line is that the blood test is only the first step. A biopsy is what really seals the diagnosis. There are exceptions, but this is what the American and British Gastroenterologist Groups recommend (along with all major celiac medical centers). You might have to go to a larger town to find a more competent GI. ? It is always a good idea to keep and maintain your medical records. I am glad you did! (Make sure you prin t or save from your patient portal). Share your results. Your TTG result could be elevated from something else. Sorry for the wonky format- looks like I had a 39 on the dual antigen screen. I can’t get the test to pull in a better format. The GI doc said that he would repeat blood tests but that he admitted that since I had been gluten-free that it may skew my results (seriously shocked that my levels were back to normal in just 8 weeks!) and complicate diagnosis. He said the scope was invasive and wouldn’t really recommend. He said based on the blood test, the fact that I had rashes, and the fact that I felt better on gluten-free, he was comfortable saying I had celiac. Fast forward to a week later when I got the results, his office called me with “congratulations, happy to report that you are 100% celiac free! !” So, I was very confused. They said that because of that negative test, I didn’t need to go back ever. I don’t think that sounds right and want to get accurate testing. Wonder if my original test will suffice for diagnosis? Anyone know the accuracy of the dual antigen screen? The GI doc said that he would repeat blood tests but that he admitted that since I had been gluten-free that it may skew my results (seriously shocked that my levels were back to normal in just 8 weeks!) and complicate diagnosis. He said the scope was invasive and wouldn’t really recommend. He said based on the blood test, the fact that I had rashes, and the fact that I felt better on gluten-free, he was comfortable saying I had celiac. Sounds like you are diagnosed. Get back on the diet strictly and hope you are feeling better real soon. The test should be accurate and it sounds like you have DH. That might be the reason to skip the endoscopy. Read through the DH section for valuable tips and welcome to the club! Thank you! I am just wondering why the GI Specialist didn’t act like the first blood test was a firm diagnosis? Maybe something got lost in translation between him & office? I have read that some tests are more effective than others, so I figured the test I got maybe wasn’t the “good one.” I may as well follow up with another blood test since I’ve gone this long eating gluten, but if it comes back negative, make sure the specialist goes over that first test more thoroughly. I feel stupid for doing this test over (my husband hates that I’m eating gluten again) but wanted it in my file in case any complications arose down the road. Again, the proper way to diagnose celiac disease is through blood test screening and then obtaining intestinal biopsies. Sometimes it is impossible to get the biopsies (via endoscopy) due to various reasons like lack of insurance/financial or long wait times (up to a year in Canada). So, the doctor will have the patient trial the gluten-free diet. For others, skipping the biopsies occurs when the blood test results are super high (over 100) and they had several positives on the complete celiac panel (DGP, TTG and EMA). This happens to kids or to people who are too sick to attempt an endoscopy. Some people refuse the endoscopy. I get that. What I do not get is why your GI said it was invasive (true) but did not explain why he does not follow the American GI Association’s recommendations. Maybe I am missing something. You did get a good test. The problem is not all celiacs test positive to all of them. Some test negative to most of them and some are seronegative (about 10%). Again, maybe your rash is DH and your GI is confident that it is even without a skin biopsy. At this point, my next appointment is December 13 with me coming in to do blood work any point before then (that way the results are available by the 13th). Sounds like I should keep eating gluten in the meantime (for years my main symts have/are intestinal pain, bloating, has, general “unwell” feeling- until right before my diagnosis I was so bad I was having “accidents” and being 33 & mother of 3 I knew that something was wrong). Should I push to have the biopsy? I am a little scared of the procedure (do you need to be put under??) but want a conclusive diagnosis. Thanks everyone who answered so far!! Keep eating gluten until the 13th. You have gone this far on this challenge. Talk to your doctor about your concerns. Research all that you can about celiac disease from reputable sources (like universities and hospitals or hit the library). Become an informed patient. Then you can make a good decision about your treatment. It has been confusing. You were told you had a positive, go gluten free and then you took the test when you were gluten free and it was negative. If I were new, like you, I would be confused. I never had the cascade test. Each of my tests were separate. If your result was just based on the TTG, there might be a question that you had another autoimmune disease. But you can read (on the lab report) that if positive, the result SUGGESTS celiac disease. Even the lab knows that an endoscopy or other factors are needed for a diagnosis. I am not a doctor. I can only offer you advice based on my personal experience and limited research in the topic. My result was odd, but I knew that I needed an endoscopy to really determine if I had celiac disease. My hubby had gone gluten free some 12 years before me. I knew exactly what the diet meant. I was shocked. I did not even have the common GI issues (had anemia). But the biopsies revealed moderate to severe patches of villi damage. This is a genetic disease. So, I had my kid tested ( and she will continue to get tested for the rest of her life). Two months after my diagnosis, I fractured my back doing nothing. Got my osteoporosis diagnosis. Looking back, I probably had celiac disease since I was a kid with symptoms waxing and waning. Only you know your circumstances (and your doctor). But this is a lifelong commitment for your health and you should at least have confidence in your diagnosis and doctor. I have gone out of my health network a few times for second opinions. Like I save my uterus. My GYN convinced me that my heavy periods were due to my fibroids. But it was a whacked out thyroid,menpopause, and celiac disease. My second and third opinions from two other doctors told me not to do the surgery. Who knew? Once I went Gluten Free, my thyroid stabilized, I went through menopause and my anemia resolved. All from gluten! You had positive blood work that became negative after a time on the diet and are having a reoccurance of symptoms on a challenge and your doctor has said he considers you diagnosed. Whether you choose to do a biopsy is up to you. You will be put under for the procedure unless you choose to do it unsedated. A very few people have done that but it would be uncomfortable. It looks like you already have a conclusive diagnosis from your doctor. Maybe check and see if he/she added it to your file if that is your main concern. They told you that you were 100% celiac free?!!! It is hard to make out what test you had done but I am GUESSING It was a dual TTG/DGP screen. I had a dual DGP test, but my assays always separated the TTG from the DGP. The problem with the dual screen is that you have no idea what is positive. TTG can be positive in other diseases and so can DGP. Recent studies suggest that DGP is not as reliable as once thought. In fact, there are studies of young children having positive DGP screens which go on to become negative DESPITE continuing on a gluten containing diet. Your assays does not distinguish so we have no idea what is causing that positive. My doctor, who is a leading celiac researcher, is not a huge fan of these combined screens. That being said, they are not without total value obviously. And it is interesting that your numbers went down on a gluten free diet. Was the SAME screen done for your second test? Do you have copies of that? Enjoy those donuts for awhile longer (please have a chocolate covered white cream filled for me), ask to go to a lab that separates the assays so you are having: Total IGA, DGP (both IGA and IGG), TTG, and EMA. Consult with a dermatologist to see if they can biopsy the rash if it occurs as it could be DH. This would be a diagnosis of celiac and you could avoid the endoscopy. If your insurance covers it, do the genetic test. But do nto go crazy spending out-of-pocket fudns on that if not covered. The scope is not crazy invasive. Christ, I think I was scoped like 4 times in under 2 years. The meds make me queasy but we resolved that the last time. Oh, and do any of your life insurance policy planning BEFORE you get the official celiac diagnosis on your record. I am guessing this is the test they will repeat when I go in on Friday. Is this the most comprehensive test? Just want to make sure I am thorough as it seems people on this board know more than the doctors sometimes! Thanks all! "ok- so back in September I went to my primary care doctor with symptoms of bloating, horrible diarrhea, nausea, etc. I took a blood test, and it came back positive for Celiac Disease. " -----I would take this as positive personally. If you want gold standard diagnosis for medical reasons or to motivate other relatives to seek testing then continue your challenge, although you are symptomatic it sounds like you are tolerating it the best you can.
."I want an accurate diagnosis for my file so have decided to take the gluten challenge. I started getting symptoms back about 2 weeks in, like headaches, bloating but the really bad symptoms just started (I’m 5 weeks in- horrible stomach pains and diarrhea, face sores, rashes on arms). I have been eating TONS of gluten. Think a bagel and multiple slices of pizza a day. I planned on taking the blood test 6 weeks in but am scared this will not be enough time. If the second test is negative, should I just go with the results of the first test? " I would hate the Specialist to give me an all clear if I really do have this condition. I also would hate for these 6 weeks of suffering to be for nothing. -----On some level it hasn't been you have a primary blood test positive, and a response to gluten after being 8 weeks gluten-free. If you have an appointment with GI for the scope try to complete the challenge to resolve the issue in your mind. ----Being a mother if you can complete the endoscope and you have gone this far it maybe helpful for your children. My children pediatrician would not test them for Celiac when I asked because I had not done a gluten challenge. My kids (both) have celiac/NCGS symptoms. My son has my additional food intolerances to corn and milk as well. Initially my daughter did not think she had issues she has since stated being gluten-free at home and then eating it out and about that she knows it is a problem for her. I had twilight for endoscope and colonoscopy at same time- not completely knocked out like other procedures I have had. You come to faster. I do recall having an irritated throat feel (milder than a sore throat) for a few hours, but the procedure didn't cause additional discomfort. Most of my discomfort was my gluten symptoms joint pain etc that had nothing to do with the procedure. ---- Then you know what you truly want to do, good luck finishing, you likely will get your diagnosis, but if you do not remember based on what I am reading you have some strong evidence gluten should not be in your life. I was gluten-free for 3 1/2 years prior to my celiac testing/challenge and when a waitress fed me full on gluten (despite my efforts to order properly call ahead etc) my body revolted with symptoms above and beyond all those before and many more serve which is what finally brought me crawling to the celiac clinic. While occasionally a hit of CC was handled once she served me full on gluten-Wow was I bad. Yes. That assay should be the one they repeat (sorry for my late response, I see it is Friday), not the one you initially had. Eventually I went out of state to a celiac specialist, did another gluten challenge and the biopsy found damage the second time around. Even THEN the pathologist initially only read a slight increase in a particular cell with no villi damage. 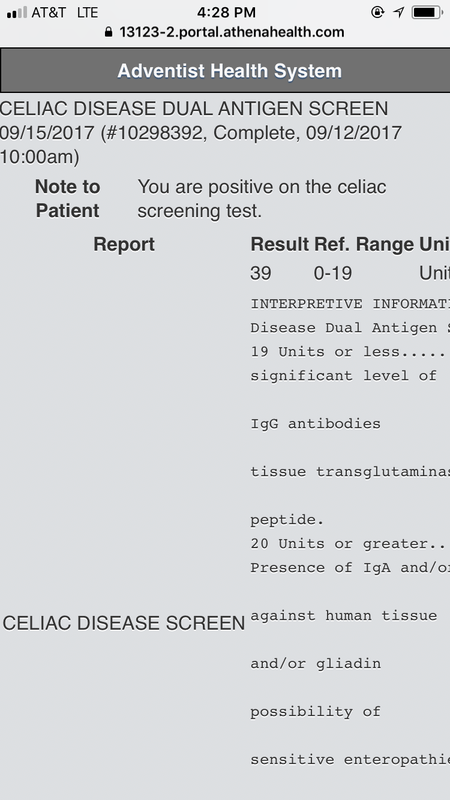 My doc re-cut the samples and re-read it at the Center as having damage consistent with celiac. I had no idea they could even do that and was totally shocked when I got the phone call. My specialist is leaning toward official celiac but we have to wait for the year biopsy follow up before it is definitive. I hate to tell you this, but they put me on a 12 week challenge at the specialist because they did not feel the 6 week challenge my local doc had me do was long enough. My symptoms the first challenge also did not really kick in until 4-5 weeks. That is actually fairly common I am told. We often think it is immediate, and it is for some, but not all. I hope you get some answers soon. It was difficult for me to accept because I did not feel better on a gluten free diet right away. Even now, months into it, I am having horrible upper right side pressure today, tenderness to the touch in the right abdominal region and tender right ribcage. BUT, I think even if your tests are negative, you could try the gluten free diet and see if you feel better. It sounds like you already do feel better on the diet. I am going in for a biopsy this month. The doc said it was telling that my IgG levels rose to abnormal during the 6 week challenge. However, he said Celiacs much more commonly have IgA levels elevated and not IgG so he was still on the fence about saying celiac due to ge fact it was not the IGA. 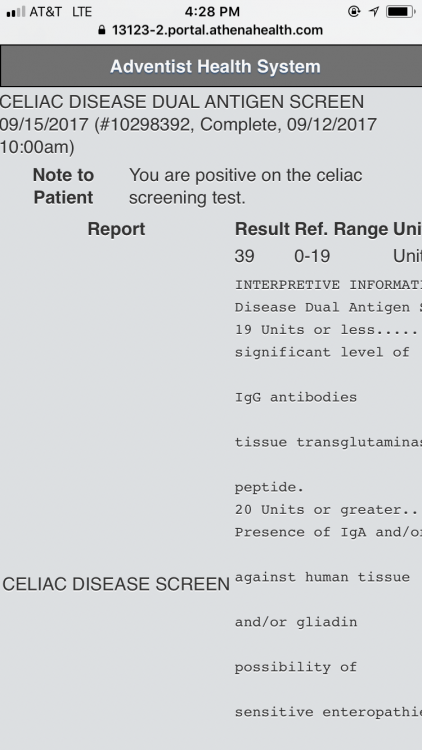 Anyone have a positive celiac diagnosis with elevated IgG?